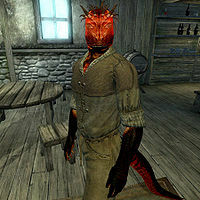 Otumeel, an Argonian rogue, is a prankster living in Leyawiin. He lives a rather relaxed existence in Leyawiin and spends most of his time walking around town. He wakes up every day at 6am and spends the first two hours wandering lazily around in his house. He leaves at 8am and strolls around downtown Leyawiin, preferably at the town's popular gathering point, the plaza at the bottom of the stairs leading to the Blackwood Company. At midday, he enters the Five Claws Lodge for a two-hour lunch. He then spends the afternoon wandering around town until he finally reenters the Lodge at 6pm for an evening of socializing until his bedtime at midnight. He breaks off this routine at 8am on Sundas, when he will enter the Chapel of Zenithar for a two-hour prayer. On rainy days, he will cancel all outdoor activities and stay inside his house. During the Fighters Guild quest Drunk and Disorderly he will, like all the other regulars, stay away from the Five Claws Lodge and simply stay at home. Otumeel wears a lower-class outfit consisting of a burlap vest, sack cloth pants, and a pair of sack cloth sandals. He also carries the key to his house and a few pieces of gold. In combat he relies on a leveled set of rogue spells. When you meet him for the first time, he will immediately start out his small pranks: "I'm Otumeel. But I didn't do anything. Really. It wasn't me. Hahaha! No! Really! It wasn't me! Never!" He will then proceed to tell you about his weird pranks involving barrels: "Okay, okay! I'll tell you! It is so great! I sneak into people's houses, take things off their tables and shelves, and put them into barrels! Hahaha! Isn't that rich? They think the things are stolen, but no! They are right there! They just don't know!" He never actually does this in the game, however. Esta página foi modificada pela última vez à(s) 05h39min de 20 de outubro de 2015.